Astronauts Alvin Drew and Stephen Bowen prepared for a final spacewalk Wednesday, a planned 6.5-hour excursion to carry out a variety of maintenance tasks outside the International Space Station. Floating in the Quest airlock module, Drew and Bowen plan to switch their spacesuits to battery power at 10:18 a.m. EST (GMT-5) to officially begin the Discovery crew's second and final spacewalk. For identification, Bowen, call sign EV-1, is wearing a suit with red stripes around the legs. Drew, EV-2, is wearing an unmarked suit. This will be the 155th spacewalk devoted to station assembly and maintenance since construction began in 1998, the fourth so far this year, the second for Drew and the seventh for Bowen. Assuming the EVA runs the full six-and-a-half hours, Bowen will move up to sixth on the list of most experienced spacewalkers. 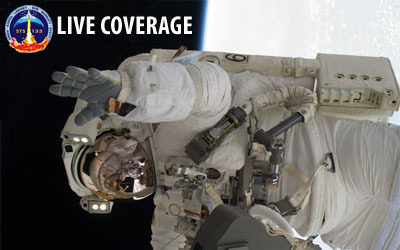 The goals of today's spacewalk are to vent residual ammonia from a failed pump module that was mounted in a storage enclosure during the crew's first spacewalk Monday; to install a camera and protective lens cover on a Canadian robot arm extension; to attach a protective lens cover to a camera on the station's robot arm; to retrieve an experiment mounting platform; to install a light on a crew equipment cart; and to conduct a variety of other maintenance tasks. "The first order of business will be to go to the pump module, the ammonia pump that failed last summer on the space station," said space station Flight Director Chris Edelen. "That pump module was transferred on EVA-1 down to a stowage platform next to the airlock. It's being configured for return (to Earth) this summer. "So they're going to go down to the pump module, and there is an ammonia venting line that's already been hooked up and (Drew will) throw the valve on that and vent the few pounds of residual ammonia that remain in that pump module." To make sure no ammonia gets on the crew's spacesuits, a hose is in place "that stretches from the pump module to a point well away from either of the spacewalkers," Edelen said. "It'll be pointed down toward the Earth so it will not be spraying anywhere near the spacewalkers. And as a final precaution, we've arranged for this activity to take place at the beginning of the EVA so if they do get inadvertently sprayed with some ammonia, there'll be time to allow that to sublimate, that's evaporation in a vacuum, so that ammonia will dissipate into space harmlessly." The pump module is scheduled to be returned to Earth aboard the shuttle Atlantis during the final planned shuttle flight this summer. While Drew vents the pump module, Bowen, anchored to the end of the station's robot arm, will retrieve a no-longer-needed equipment platform from the European Columbus laboratory module and move it to Discovery's cargo bay for return to Earth. Drew, meanwhile, will remove no-longer-needed insulation on a newly installed cargo pallet on the right side of the station's power truss and install a light on a crew equipment cart mounted on the front side of the truss. After mounting the equipment carrier in the shuttle's cargo bay, Bowen will head to the forward Harmony module where a Canadian robot arm extension, called the special purpose dexterous manipulator, or DEXTRE, is mounted. "The crew will be installing a second camera on DEXTRE, our robot that lives on the outside of the station," Edelen said. "He has two arms and two hands that can do all kinds of external maintenance tasks and he has right now one eye on one side of his body. "So we're going to put (on) another eye ... a camera that can pan and tilt and move around, which will give the robotics operators better visibility when they're using DEXTRE. The crew will also be installing some transparent, protective lenses over several of the cameras on our robotic arm and on DEXTRE." Bowen also will remove no-longer-needed insulation from the robot. A variety of other general maintenance tasks are planned, including work by Drew to tighten a loose fixture on the left side of the power truss that would be needed if a coolant system radiator needs service in the future. The excursion is scheduled to last six-and-a-half hours, followed by a mission status briefing at 7 p.m. UPDATED: The official embroidered crew patch for shuttle Discovery's final flight is available in our store. Free shipping to U.S. addresses!